Explanation: Mars' atmosphere is relatively thin, still when martian winds blow they weather and shape its surface. Like familiar aeolian features on Earth, this field of dunes within Mars' Rabe crater exhibits graceful undulating ridges which can shift as windblown material is deposited on the dunes' windward face and falls away down the steeper leeward slopes. 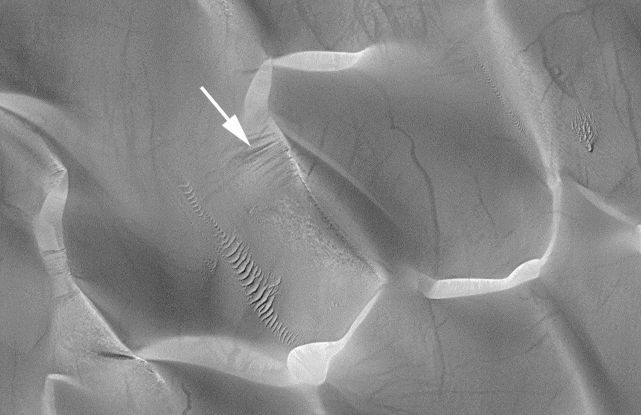 Indicated by the arrow, the dark trails are signs that the martian sand has avalanched down the steep slopes in the recent past. Rippling patterns of smaller dunes are also visible in this sharp high-resolution view along with criss-crossing dark trails which may be evidence of local dust-devil windstorms. The image is about 3 kilometers across and was recorded in March of 1999 by the orbiting Mars Global Surveyor spacecraft.